It’s late Friday afternoon at 4:00, and you’re checking next week’s calendar to make sure there’s no loose ends you need to tie up before the weekend. You gulp as you look at that four monoliths blocking out Monday - Thursday* that read “DESIGN SPRINT” staring coldly at you. Yes, that’s right… on Monday morning, clients will look to you to be their Design Sprint Facilitator. A couple months ago you read the Sprint book, and maybe three weeks ago you completed a masterclass. 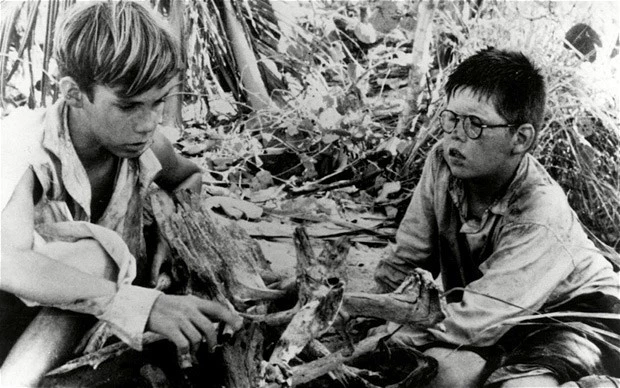 You helped your sales team book a client, and you’ve explained the process to a designer. You’ve watched the videos and listened to some podcasts. And yet, you still have a feeling of immanent dread as you realize that you have no idea how this thing is going to work out. You have the right ideas in your head, but how will they translate from cognitive to actionable? Or will they? Do you have what it takes to facilitate a Design Sprint? Your clients are ready… are you? If the hypothetical above scenario doesn’t seem too far from reality for you, fear not! This is not a time for doom and gloom. Rather it’s a time to breathe in & zoom out. It’s time to go through what I’ve called The Five Steps of Confidence if You Want to Be a Confident Design Sprint Facilitator in Five Steps. (on second thought, let’s just call them the five steps for brevity). 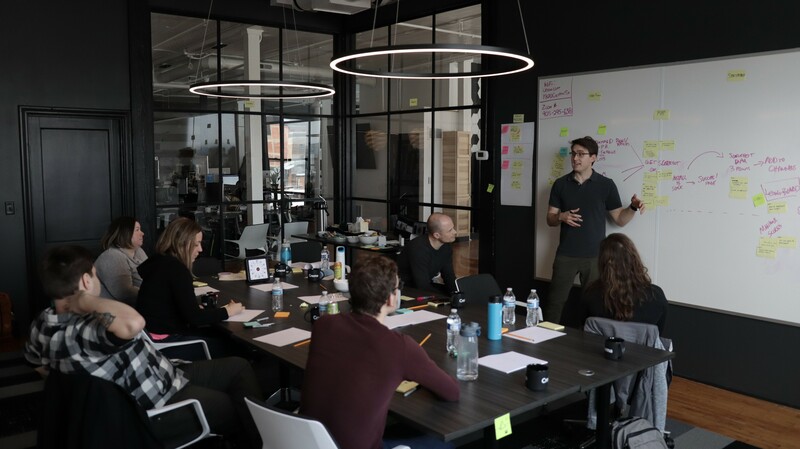 The five steps will remind you about what is and isn’t expected of you as a Design Sprint Facilitator, while providing mental and physical exercises that will get you in ship shape. When we talk about Design Sprints with clients at Crema, we don’t say “we’ll solve your problems.” That’s not what a Design Sprint is. 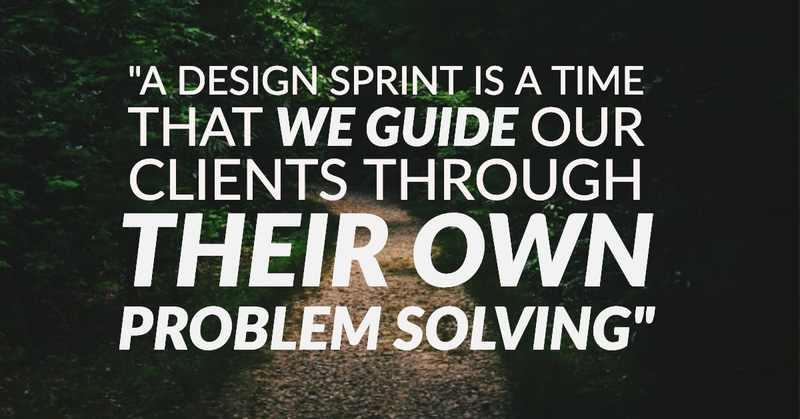 A Design Sprint is a time that we guide our clients through their own problem solving. 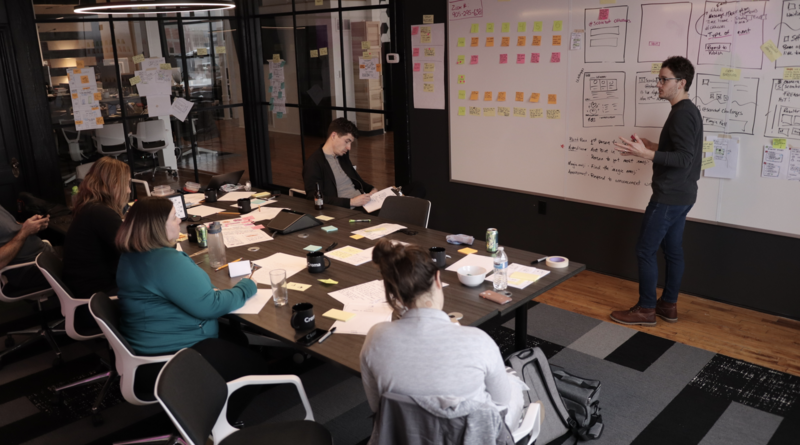 Design Sprints hinge on the idea that when you get the right people in the right room and have someone keeping them on track and focused on one goal, they’ll come up with an amazing solution. After all, they know your product or service better than you do! So, take the weight of your client’s problems off of your back. It’s not up to you to solve them. It’s up to you to facilitate them. Remember, you’re the Design Sprint Facilitator, not the CEO of their company or the Decider. You may have to keep reminding yourself of this, but you can never say it enough. When you know what you’re not supposed to be, it makes being what you are supposed to be a lot more freeing. I cannot stress this enough: saying something out loud is more telling (literally) than knowing it in your head or reading it in a book. Ask someone you’re close to if they could spend an hour or two “helping you prepare for a presentation at work.” It’s like when you were a kid and you had your sister help you study for a history test or asked your friend to watch you prep your audition piece… just in a professional setting. You’ll explain what a Design Sprint is, AirPlay (or cast, or whatever) your slides to the screen, and speak to your buddy as if they were the client. You’ll realize that you may have some slides that are missing. Put them in immediately. You’ll realize you thought you knew some exercises better than you actually do (I’m lookin at you, 3-Part Sketch). Take note and revisit them later. You’ll realize there’s some great jokes you could put in there. Run them by your comrade and hear what they think. You’ll realize that your “perfect metaphor” needs some serious revising. (This is my favorite one) Your sidekick will all of the sudden be super intrigued about the Design Sprint! It’s one thing for you to tell someone “yeah, I’m going to be a Design Sprint Facilitator next week.” It’s another for them to see what that actually entails. You’ll start hearing things like “This sounds so cool!” And, they’ll ask you about it after the Sprint. Imagine, someone you care about not just caring about what you did at work, but having context for what exactly you did! Note: Though it is ideal to have someone in the room with you, it is not mandatory. You still need to do this exercise, out loud, even if to an empty room or infant in a bouncer. It’s invaluable. Doing this exercise serves two purposes. It makes you far more confident to navigate the room and interact with your clients. 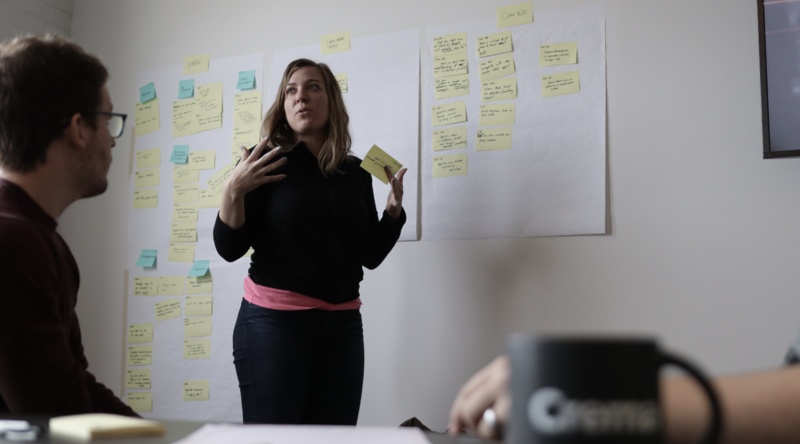 A good Design Sprint Facilitator is one that feels confident… and comfortable. 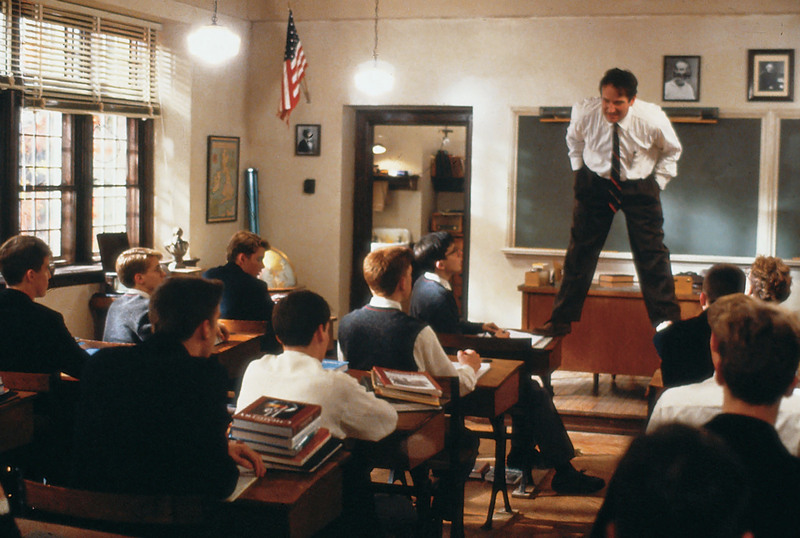 You should feel like Robin Williams in Dead Poet’s Society, moving effortlessly throughout the room and engaging your clients. This helps you do it, because you know where you need to be, when. Okay, maybe not this comfortable. You just may realize that you’ve got some spacial problems to solve. Now that I know how our Sprint Room is laid out at Crema, I know that some things get moved around from Day 1 to Day 2. Some spaces are used twice, and some need to have photos taken of them and posted elsewhere. If you don’t walk through your room and actually put some things up and draw some things out, you may end up frazzled when your you say “Let’s Storyboard!” to the client only to see that the Map is still there, and someone is erasing it before you got a picture of it. Social Psychologist Amy Cuddey delivered a fascinating TED Talk, Your body language shapes who you are, in 2013. In it, she explores how our body can affect our brain. 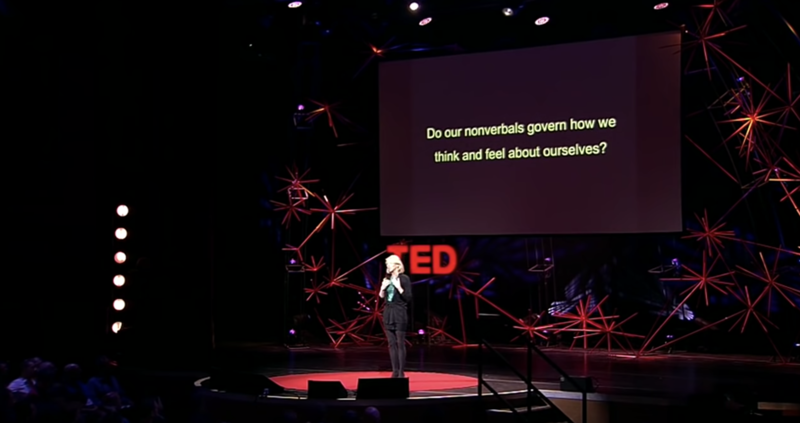 Specifically, she asks the question, “do our nonverbals govern how we think and feel about ourselves?” Her answer? Yes. Now, you’ll have to watch the talk for full detail, but I’ll do my best to summarize a fascinating study she discusses. She reveals that spending even two minutes in “low-power poses” noticeably decreases your body’s testosterone (which in turn lowers your confidence), and noticeably increases your body’s cortisol (which increases the amount of stress you feel). The inverse is true for spending two minutes in “high-power poses:” more testosterone (more confidence) and less cortisol (less stress). Think about it. When we are sad, we slouch. When we win, we throw our hands in the air (she specifically mentions that blind athletes also throw their hands in the air when crossing a finish line, revealing it is not a cultural habit but a biological reaction). So, it’s ten minutes before clients knock on your door? Go to the bathroom, or a closet, or a stairwell, and hold your hands up high. Smile. Put your hands on your hips like you’re like a mix between Mr. Incredible and a Design Sprint Facilitator. It may feel silly, but don’t be deceived – your body is chemically reacting to your actions. Note: she also mentions that people perceive many things as “confidence,” including passion, authenticity, comfort, and enthusiasm. Maybe you don’t feel confident, but you can be passionate and authentic, and it’ll come across as confident! This little mental switch is essential to any sort of “in-front of people” activity. You’re almost certainly going to feel “butterflies in your stomach.” Heck, I’m legitimately getting them as I type, just thinking about that feeling of walking in and leading clients through a Design Sprint. The thing is, butterflies aren’t bad. In fact, they’re good! They’re there to make sure that we don’t feel too cocky, too arrogant, or too headstrong. They keep us on our toes and remind us that we’re still human. I have always been a “people person” and felt very comfortable in front of crowds. 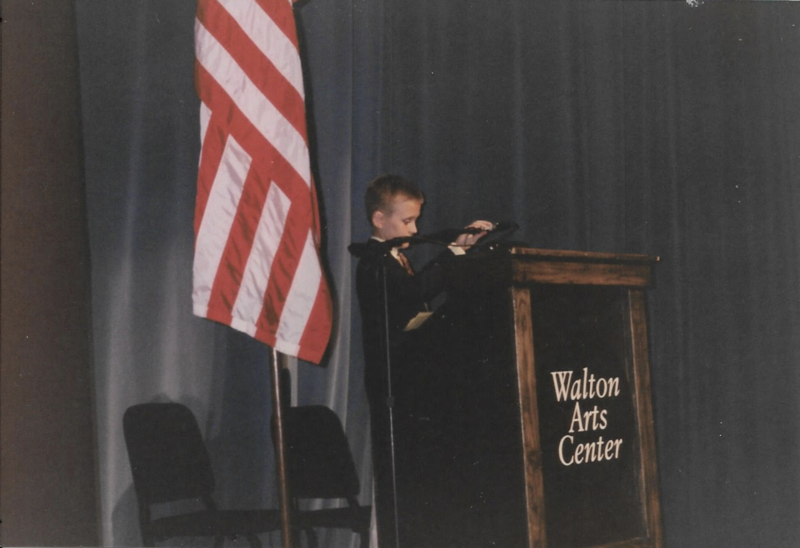 I hosted my 4th grade talent show as an MC, was in countless musicals and stage plays in high school, have preached many times at church, and was in competitive drama across the state of Arkansas (’08 Improv State Champs, represent!). And I have always felt butterflies. Every song I sang, every sermon I preached, I felt the butterflies coming in. Over time, I learned to love the feeling. It’s a total rush, like jumping from the high dive or feeling the “click-clicks” as you climb a hill on a roller coaster. Don’t be afraid of them. Lean in. Simply name them and acknowledge that they exist, and then remind yourself of why they’re there. In We Bought a Zoo, Matt Damon’s character tells his children about the time that he met his to-be-wife. He reflects on walking past her on a sidewalk as she sat in a diner. So you may be afraid. You may be terrified. You may be wondering how on earth you can possibly be a Design Sprint Facilitator, because you think you’re horrible in front of people. You may think you’re ill-equipped and unfit for such a role. You’re not solving their problems. You’ve walked through the space. You’ve named and leaned in to your butterflies. Now, all it takes is 20 seconds of insane courage. Go in to that Design Sprint room, shake your clients hands, and be the Facilitator you are. Justin Mertes is a certified Design Sprint Facilitator at Crema.